Account details first establishment of rural mail delivery by the one responsible for that service - Renne Allred, Sr., of Bowie, Texas. Here is excellent early Montague county, Texas history and genealogy. Benjamin Rush Milam, the hero of San Antonio, was born October 20, 1788, near Frankfort, Kentucky. His parents were Moses and Elizabeth (Boyd) Milam. At 24 he joined the United States Army and fought in the War of 1812. In 1815 he and John Samuels went to New Orleans, and sailed to Maracaibo. In 1816 Milam is said to have come with Xavier Mina's expedition to Galveston Island. Thus began Milam's fateful legacy as one of Texas' chief patriots and heroes - here is his story. Capt. 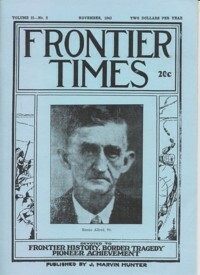 Ira Aten's "Round Robin"
Notable Texas Ranger captain, Ira Aten, who retired to El Centro, California, after faithful service in the Rangers, leaving an almost unparalleled legacy of accomplishments, kept up with his many friends by means of "Round Robin" letters, which were sent to every one of his brothers and sisters, and also to his friends. This letter contains much valuable and interesting eye-witness information. By L. R. Wilson, Minister, Church of Christ. 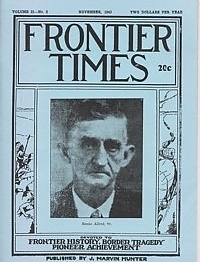 This installment continues to examine the earliest days of the Buffalo hunting industry on the Panhandle and interviews one of the early buffalo hunters. Also details a notable waterhole fight near Van Horn, TX and finally, of Jim Downs' perilous tramp across the plains in the summer of 1876 from near Fort Stockton to the mouth of Silver creek, a distance of about 200 miles. A passion for independence and a loyalty to his comrades and to his duty were the outstanding characteristics of cowboy philosophy - a philosophy not necessarily articulated in words, but lived out. These and other characteristics are described in this account as the cowboy way of life and thought. Account of "Bad Nell", woman outlaw who was a thief and a poker player, a good shot with a pistol and as good a horse rider as any man —and she played her game solitaire—she didn't have to have any men confederates. Account of the strange disappearance of Peter Elias Bean, father of Ellis P. Bean and Indian agent for the Mexican government 1824-1826 who had located at Mound Prairie, in what is now Cherokee county. His strange disappearance and the eventual discovery of his whereabouts is detailed in this account. Account of quaint little Indian pueblo known as Isleta, located about 12 miles south of Albuquerque, a village with a history being settled before the coming of the Spaniards.